June is National Home Safety Month, but just because they have a special month for it, home safety is something that should be on everyone’s minds all the time. Air Specialist cares about you and your family, so we’ve put together the top 15 home safety tips to help you get started. Working smoke alarms, with fresh batteries, should be located in each bedroom, outside of each sleeping area and every level of the home. Test your smoke alarms each month. Check electrical cords for any frays or if they exhibit any warmth. If so, unplug them immediately. This month, have your family develop, discuss and practice an evacuation plan in case of fire or another emergency. Cover all unused outlets with safety plugs. Install hardware-mounted safety gates at the top and bottom of every stairway in the home if you have kids. Have an emergency supply kit filled and stored where anyone can get to it if the need be. Mail slots go against the wood grain of a door, which weakens the horizontal integrity of the door, making it easier to kick in for home invasions. Keep your car keys next to you while you sleep—if you hear any suspicious noises in the middle of the night, you can turn on the alarm on your car to scare away any intruders. Consider planting thorny bushes (i.e., rose bushes) under ground-floor windows. 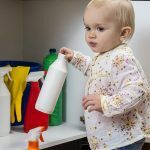 Use childproof locks on any cabinets that contain cleaning supplies, soaps or medicines. Keep any medicine or other items that could be ingested out of children’s reach. Keep all exposed hot water pipes covered. Keep walkways clear of any clutter, especially throw rugs that can pose as a slip hazard. Have fire extinguishers on every floor of the house. Make sure your house number is clearly marked on your mailbox and on your house so it can easily be seen. Make sure all televisions, stereos and computers on a sturdy stand that is not easily tipped if a child were to try to climb the front. Take an afternoon to make home safety something you can work together with your family this month.